Elephant Moving and Storage is pleased to offer plastic packing crate rentals to customers in the greater Austin, Houston and San Antonio areas. These durable plastic crates are an earth-friendly alternative to the traditional method of packing in cardboard boxes. Our moving packing crates feature an attached lid for ease of use and the sturdy plastic body provides superior protection for your household goods. The crates are stackable and easy to move and are cheaper than purchasing large quantities of cardboard boxes. Crushproof, which means no damage to packed contents. Packing Crates can be rented in increments of 25. Rates for our plastic crates include 2 full weeks (14 days) of rental. Delivery and pickup are included in the price. Unforeseen delays with your move? No Problem! An additional week can be added at a deep discount. Add some packing paper and bubble wrap to cushion your fragile items and you are ready to pack! Call our office today to speak to a sales representative about how our plastic crates can save you time and money! 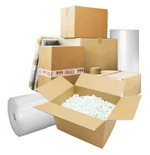 Elephant Moving stocks a wide inventory of moving packing materials – everything you would need in preparing a move of your home or office. Remember: we’ve done this a million times so we know, given your estimates, exactly the products and materials you’ll need. We’ve moved families and companies for years. Year after year and move after move, we’ve found that these simple moving and packing tips will save you significant time, money and frustration. Things to pack last: toolbox, soap, rolls of toilet paper and paper towels, one bottle of cleaning solution.